Curry ended with 22 points (6-11 FG, 3-6 3Pt, 7-7 FT), two rebounds, and one steal in 21 minutes during Saturday's 127-120 victory over the Suns. Curry went off for a season-high 22 points Saturday, with many of them coming in garbage time. 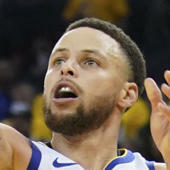 Curry has been hampered by the arrival of Rodney Hood (hip), however, Hood left this game with a hip injury and should be considered questionable for Tuesday's game. Any absence could certainly afford extra playing time for Curry. That being said, he would likely emerge as a three-point streamer only given his inability to contribute in multiple categories.